Hannah and Jonathan couldn’t have picked a better day for their wedding in August, 2016. The sun shone all day the vintage car behaved impeccably and the grand piano Hannah had installed for the afternoon was played to perfection by their friend Alastair. 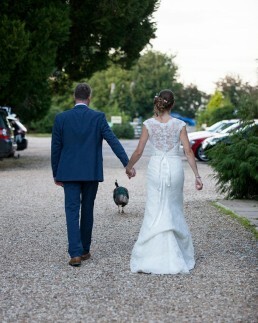 None of the guests got lost between the Church and the venue, the fabulously friendly Hornsbury Mill, and the peacocks even posed for us! They even had a doggy bag of wedding cake, a gorgeous pavlova made by their friends Tareg and Leota to take on their honeymoon at The Scarlet Hotel in Cornwall.